Welcome to paradise on Anna Maria Island! This 2 bedroom Bay Front vacation condo has spectacular views stretching south from the Sarasota skyline all the way north to the Sunshine Skyway. Relax on the patio of this Bradenton Beach condominium rental, or in the pool and watch the dolphins play and the sailboats drift by. The world famous sugar sand beaches of Anna Maria Island are only a few steps away, along with Historic Bridge Street which is home to many unique shops and restaurants. When you enter the home you’ll find it warm and inviting with its open floor plan and fully equipped kitchen featuring stainless appliances and sprawling granite countertops. Enjoy a fresh cup of coffee or tea on the covered patio while the sun comes up and take a short walk to the beach to take in some of the best sunsets anywhere. The master suite features a king size bed and a large walk in closet while the second bedroom is every bit as elegant with a queen bed and a pull-out day bed. This home can comfortably accommodate up to 6 guests and comes equipped with all the amenities of home. You will also have elevator access from the garage included in your reservation. If you want to explore you can take advantage of the free trolley with stops along the full length of the island. You won’t ever want to leave and we are confidant you’ll return year after year to this Island paradise. The location is perfect! The house had a few issues .... the bathroom door in the master bedroom would not latch or stay shut all the way, the couch had some stains on it (it’s white so I’m sure it get dirty easily), we only had one house key until i called again for one on Tuesday and the grill that was listed as an amenity was missing. The washing machine was broken when we went to use it on Sunday and didn’t have one replaced until Wednesday - no response when we called on Sunday and left a message - I had to call Monday - was told someone would come - no one came - called Tuesday morning and was told they would come repair it - unfortunately it couldn’t be repaired and we had to wait yet another day. So on our 5th day of vacation, I washed clothes most of the afternoon ... 6 people (one of them 6 months old) had 5 days worth of laundry ... it was just disappointing that it was broken when we arrived and no one knew .... we visit Anna Maria often and this was our first time staying here. We would probably stay here again .... possibly .... I just hate I had to stress about laundry for five days - especially with an infant. For the cost of the rental, I wish we could have had a stress free vacation. We thoroughly enjoyed our stay here. There were no other people staying at the houses near us, so it was very quiet and peaceful. My husband and boys loved fishing off the pier. The house was modern, and the kitchen was big. My husband enjoyed the elevator, so he didn't have to lug all our bags up the stairs. 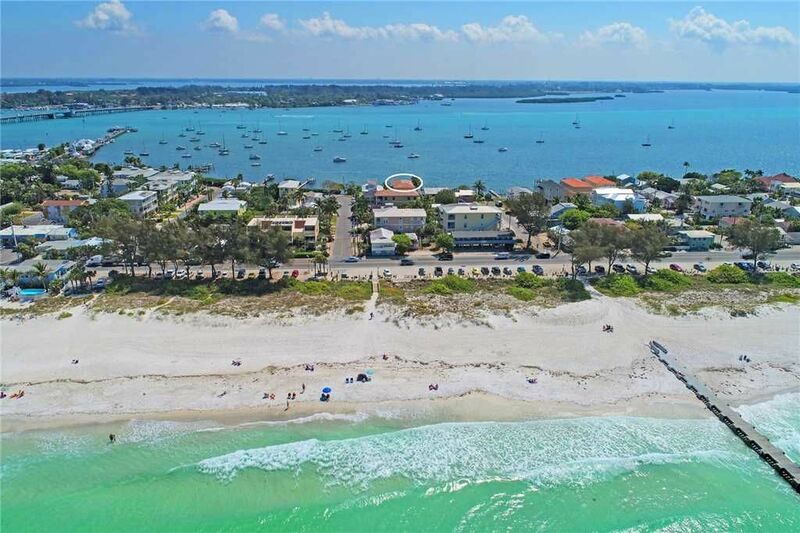 My only negative was when reading about the property I thought it was on Anna Maria Island, it is actually Bradenton beach, but it really ended up being the perfect spot, close to shops and a few steps to the beach. I highly recommend this house. You can't ask for anything more in this condo. We had our own private pool for the week and our own fishing dock that my 10 year old son happily caught many fish from. The condo is literally 200 steps from the door to the beautiful beach on the gulf side and we walked to dinner, icecream, shops and putt-putt with 4 kids in tow without an issue. We felt safe and relaxed and everything was so close! The condo itself was clean and very roomy and had everything we could have possibly needed. The beds were super comfortable and we had plenty of extra bedding. The condo also has a washer and dryer which was not listed in the amenities but was a very helpful surprise. I would revisit in a heartbeat. Worth every penny and then some!! We are so glad you enjoyed your stay and hope you make it back again soon! We loved stay at Hibiscus! Very well appointed and spacious home with great location and views. We just spent a week here and it was one of our best vacations. We really enjoyed being right on the bay and watching the birds and dolphins and boats come and go. Having a private pool was extra nice. You have a private garage on the basement level. Our unit was the whole second floor and the third floor wasn't rented when we were there. The unit had nice furniture and furnishings and was about 1500-1600 sq ft. All the room were large and very up to date. We also enjoyed having the free AMI (Anna Maria Island) trolly to ride up and down the island. Our absolute favorite is the sunsets. It's about 200 steps to the white beach sands of the gulf. Just can't beat them here on the southern gulf coast. Been coming down here for years just for the sunsets. My husband and I vacationed at Hibiscus for one week beginning May 9th, 2015. This is the first time visiting Bradenton Beach as well as staying at a location that wasn't "ocean front". The variety of birds viewed daily from our balcony was a refreshing and beautiful site - not to mention the boats! The condo itself was magical with its beachy accommodations. I simply loved this vacation location and would highly recommend Hibiscus to anyone visiting the Bradenton Beach area. Due to of the assortment of beautiful birds not always seen at the ocean I would point out that Hibiscus is a beautiful surprise from the typical ocean front vacation setting. We are returning next May!! Thank you so much for the wonderful review! We are thrilled you had such a great time and we look forward to having you stay with us again.